Eurolife encourages the participation of its students in Summer Schools of Eurolife University Members. Take a Summer School course to expand, deepen and share your knowledge. Alzheimer’s Disease research methodology, population health management, immune modulation in human and animal infections, transplantation or translational research – take part in the Eurolife University Members Summer School. Eurolife encourages the participation of its students in summer schools of Eurolife University Members. Take a Summer School course to expand, deepen and share your knowledge. 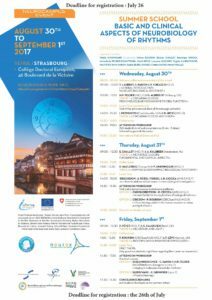 Do you wish to learn what is new in Clinical & Translational Neuroscience, Vaccinology, Clinical Education, Neuromuscular Diseases, Transplantation and (Clinical) Research or Trauma Surgery (Pre-hospital Care, Visceral Trauma and Orthopedic Trauma)– take part in the Eurolife University Members Summer School. Basic and clinical aspects of neurobiology of rhythms is a 3-days summer school organized by the University of Strasbourg, together with the Institute of Cellular and Integrative Neurosciences. The aim of this Summer school is to transmit to Master2 and doctoral students the scientific and practical bases of biological rhythms and to stress the necessity of integrating the concept of biological rhythmicity in any experimental work. 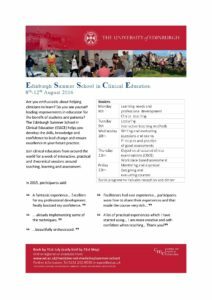 Edinburgh Summer School Clinical Education (ESSCE) is a week long course of interactive workshops to develop your skills around teaching, learning and assessment, with enough theory to give you the tools and the confidence to lead change, evaluate developments and ensure excellence in your future practice. Goettingen Spirit Summer School “Biological Research in Dentistry”. This summer school focuses on modern cell and molecular biology research in dentistry. This approach will open the different disciplines in dentistry for more medical-biological research strategies. The summer school is structured to give impulses towards a basic science research perspective in dentistry. The academic year 2014/2015, Eurolife sponsored a total of 10 grants to attend either the Summer School Immunity, Infection and Tolerance (Leiden University Medical Center) in July 6-31 or the Summer School Emotions in Motion – Interdisciplinary Approaches to Study Emotions (Medical University of Innsbruck) in September 15-17.